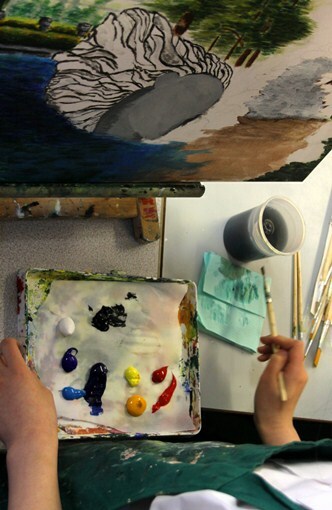 The Summer Term has flown by with the all-important Art Exams. The GCSE and A level cohort completed their portfolios before half term , and then they were marked and recently moderation exhibitions were held for the examination board to mark. This lead on to the BIG event of our year which is the Art, Textiles, Photography & Design Technology which opens on 30th June (preview evening – invitation only) then continued for 1 week only to which everyone was invited to view the amazing efforts of our Art, Textiles, Photography & Design Technology students. It is a fabulous celebration of two years’ work, which has only ever been seen in that time, in parts or as drawn designs, never in its fully completed state. To see all the students’ work in one place is a sight to be seen! We have also had two visits from practising artists who have given us presentations of their work, demonstrations and practical classes, involving print making and multi-media painting. Anne- Marie Cadman and Helen Sayer did us proud with some engaging and informative workshops. A group of year 5 pupils from AWJS paid the department a visit to experience a workshop which we provided for them. It was a grand, fun and a messy afternoon which everyone thoroughly enjoyed. The children produced famous figures using armatures of paper rolls, plaster and mod roc. Each figure assumed its own pose and details such as skis, rocket back-packs and ballet skirts were added. Great Fun! I hope we shall see the pupils again soon.